We found: 43 Exhibition Titles, which are in most cases identical with the exhibition catalog title. Looking up exhibitions of an individual artist, exhibition venue, or curator, or by exhibition title is the most common way to use artist-info. 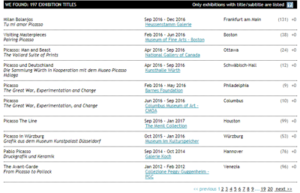 To filter and only list solo- and group exhibitions with the participating artists in the main search result We found: 43 Exhibition Titles section by using an identifier can be very helpful for the research of artist-info users. - Exhibition projects like Phenomenal: California, Light, Space, Surface, Museum of Contemporary Art San Diego, are using as source for their survey selected solo- and group exhibitions of a specific period. - Stationen der Moderne, Berlinische Galerie, 1989 describes the role of 20 important exhibitions between 1910-1970. To filter and research only these 20 exhibitions and all artists by exhibition opens up new perspectives for research using artist-info database. 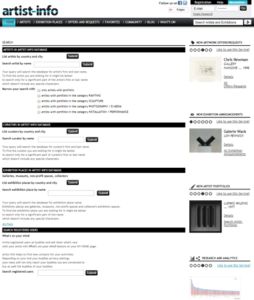 To lookup the artists of a specific exhibition is easy to handle. As exhibition histories of artist, exhibition venues, or curators represent individual profiles, you may want to look for your research and analysis of these profiles into many hundred if not thousands of exhibitions. 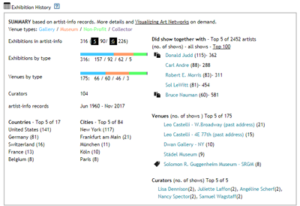 artist-info offers with visualizingartnetworks.com a new and groundbreaking way to visualize what a table with many thousand rows could never show. 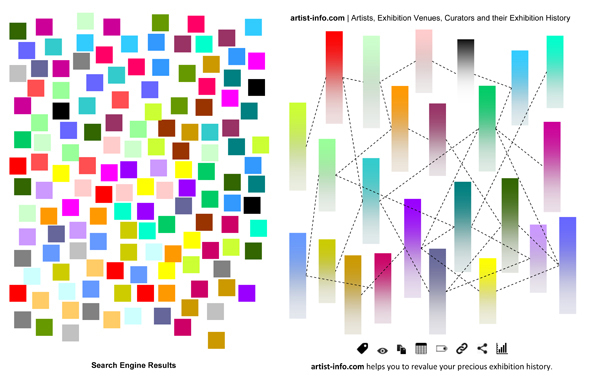 Our ARTIST-artists visualization shows the positioning of a specific artist based on her/his exhibitions in relation to all other artists in group exhibitions. Other views are ARTIST-venues, CURATOR-artists, VENUE-artists, VENUE-venues. It shows for the past 90 years how influential some artists of the collection have been, taking into account that most of them have only been known to insiders 90 years ago, when the Thomas Walther collection was started. 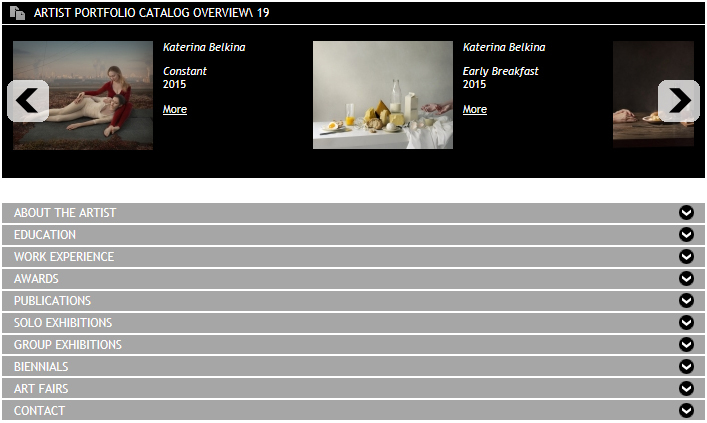 An overview of the 100 artists with the highest number of exhibitions shows our Top 100 page. You will find the number of solo- and group exhibitions, their total, number of exhibitions at galleries, museums, non-prfit and collector's venues, and the number of individual exhibitions venues where the artist's exhibitions took place. Please contact us for any custom statistics related to exhibition statistics. An interesting example is our survey Are Auctions a good place to buy Contemporary Art? Each artist, exhibition venue, and curator exhbition history has a summary section to provied a quick overview and and first analytical insight. Escape the haystack of search engine results with our 'All Exhibitions Update' service..
Show your profile with all your exhibitions in a clear and simple structure with our exhibition history documentation. Our records start as early as 1880. 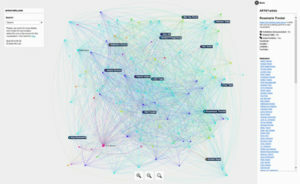 It helps in a unique way to show your valuable exhibitions profile, to discover, explore and develop the valuable connections between artists, curators and exhibition places. 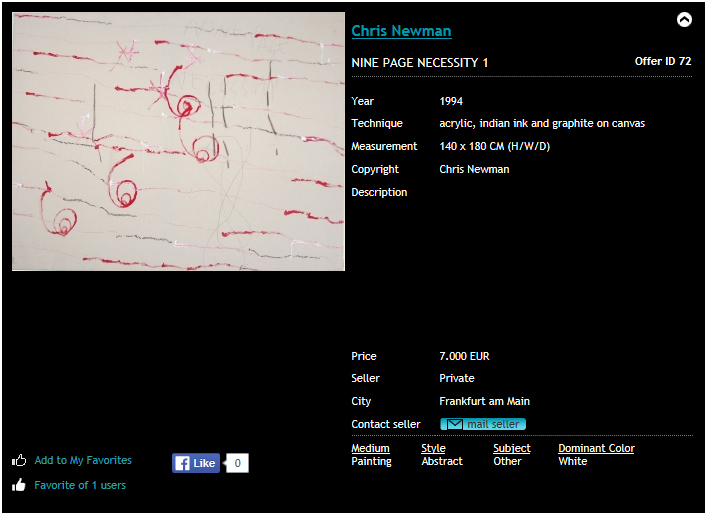 Subject to fees - Pricelist on artist-info.com Services page. Advertise your Exhibition Event with our Exhibition Announcements. - On the WHAT'S ON page - On exhibition venue's page - On all related artist pages - On all related curator pages. You set up your Announcement with your text (max 1500 characters) and an image, or an embedded YouTube or vimeo video. Your exhibition's artists and curators from your artist-info exhibition venue page are listed automatically in your Announcement. Your Artwork Offers or Artwork Requests are advertisements to sell artwork you own or to search artwork of a specific artist. 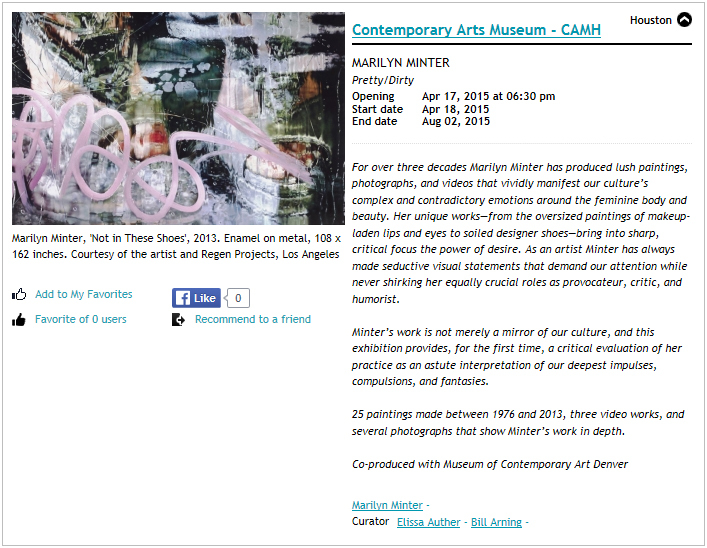 - On the OFFERS AND REQUESTS page- On the related artist's page.- On the exhibition venue's page. You get in direct touch with possible buyers. artist-info is not involved in any action between the person who offers and the person who is interested in or buying the artwork. Artist Portfolios add with text, up to 20 images and embedded YouTube or vimeo videos additional information to artist- info artist pages. Checkout all Artist-Portfolios on the Artists with Portfolio page and discover new artwork. Free of charge. Available for users registered as artist. Reach out to our worldwide audience by using our Newsletter Service and artist- info mailing list. Send us your Press Release and an Image and we setup a custom newsletter for you. See examples in our Newsletter Archive. Prices can be found in the Pricelist for Professional Users at the top of this page. Contact us for Banner Advertisement rates. 'What's on Your Mind' to reach out to your contacts and their buddies. Buddies feature to reach other users. Request Updating Exhibition History (artists). Manage Exhibition History (Galleries, Museums, Non-Profit, and Collector venues).